Specific Requirement: The applicant for a PUD shall provide the following materials (in format and number as reasonably determined by the Community Development Department). 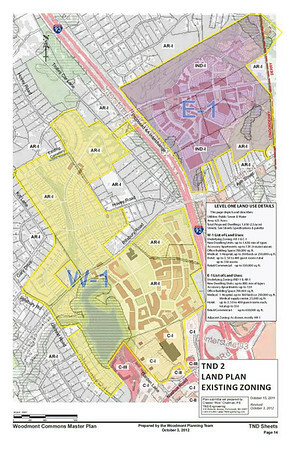 To assist the Town in understanding the locations of information in the Master Plan, the following statements of information and references to the numbered 11”x17” TND Sheets have been provided (for example, “TND 1” refers to the first numbered TND Sheet). The Woodmont Commons PUD Application is comprised of this document, the Streets Specifications and Palette, the numbered TND sheets TND 1 through TND 19, inclusive and any other reports or studies referenced herein. Specific Requirement: Narrative, including a statement of purpose for the PUD and how it meets the goals of this Section. This document is an update to the original submission of October 14, 2011 with enhanced information at the request of the Town of Londonderry. The owners’ (Pillsbury Realty Development, LLC., HYRAX Derry Partners LLC, Demoulas Super Markets Inc., and Robert D. and Stephen R. Lievens, hereafter all referred to as “Applicant”) goals are to create a revenue-positive mixed-use live, work, play community to be known as Woodmont Commons using traditional neighborhood development principles that will compliment, blend with and augment the existing community. Woodmont Commons is intended to constitute a single PUD. Woodmont Commons is intended to be a mixed-use and pedestrian-friendly development that, in many respects, will emulate historic, walkable, New Hampshire and New England towns that pre-date the invention of the automobile. Many societal needs, particularly those of senior citizens and children, are not well served by most current development concepts that segregate and separate land uses and require reliance on vehicular travel. Policies and procedures designed to mitigate traffic congestion, conserve energy, provide an alternative means of developing land and otherwise promote public health, safety, and welfare. A built-up neighborhood area with an overall size small enough to permit residents and workers, if they so choose, to walk or ride bicycles comfortably rather than being required to drive. Since many of the unique characteristics of the Project’s proposed appearance, including but not limited to its streets and buildings are difficult to describe, with sufficient detail and accuracy, images are used throughout this document to show the intended character and nature of the Project, as well as to explain, pursuant to section 2.8.10.2 of the PUD Ordinance, the developmental standards to be established for the Project by the Master Plan. Except where specially-captioned, the placement of images in this document is not intended to specifically correlate with the adjacent text, but rather to be representative of the concepts within this entire document. Simply put, images are intended for illustrative and conceptual purposes only. 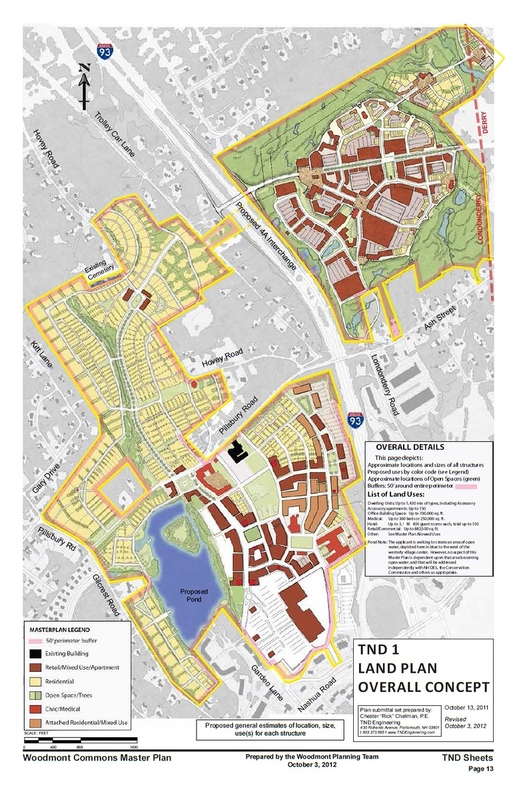 Notwithstanding Applicant’s intent to develop traditional neighborhoods, Applicant also recognizes that nearby contemporary shopping plazas already exist and that such areas should be integrated into the Woodmont Commons vision where practicable. Specific Requirement: The following criteria shall guide the Planning Board in determining appropriate land uses, densities, and other development standards for the PUD. It is emphasized that the determination of whether or not a proposal meets the intent and objectives of this ordinance is made by the Planning Board in its reasonable discretion. Woodmont Commons meets the goals and objectives of the PUD Ordinance through the inclusion of the following elements, as listed under section 2.8.8 of the Town’s PUD Ordinance, which validates the Applicant’s intent to depart from standards otherwise applicable under conventional zoning and related land use regulations. Specific Requirement: Provisions of Town of Londonderry Zoning Ordinance, Site Plan Regulations, Subdivision Regulations, and other applicable Town, state and federal law, where appropriate. Woodmont Commons is a large scale development that has been Master Planned to create a comprehensive, integrated Planned Unit Development that would be impossible to create under the existing Zoning Ordinance, site plan regulations, subdivision regulations and other related land use regulations. All aspects of the Project have been planned to be of high quality and in accordance with this application, as well as the specific requirements of the PUD portion of Londonderry’s Zoning Ordinance. Consistent with the flexibilities in the PUD Ordinance, the specific provisions of the Town’s Conservation Overlay District, the Floodplain Development Ordinance and the Local Excavation Standards shall not apply to the Project; instead State and Federal regulations shall apply. All excavation activities in the Project shall be deemed incidental to construction and exempt from permitting pursuant to RSA 155-E: 2-a (I) (a). 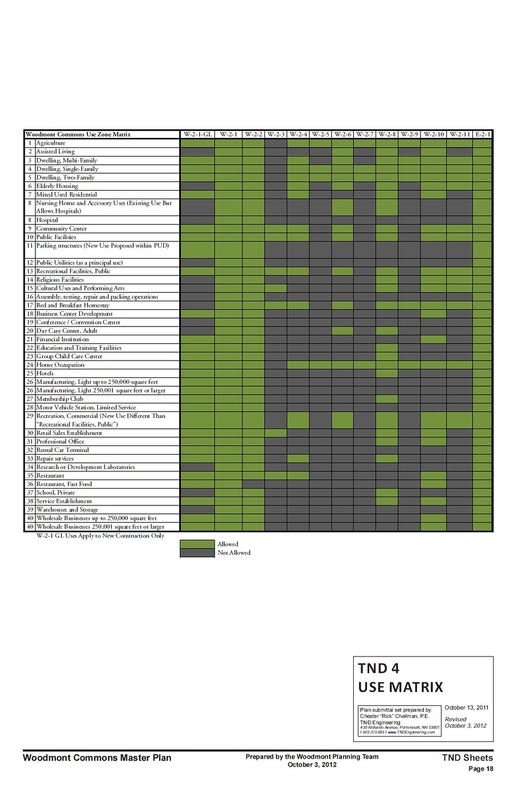 Due to the unique nature of the Project, and as set forth in section 2.8.2.1 of the PUD, in order to fulfill the Narrative and Statement of Purpose, the Project needs to be independent from existing and otherwise applicable land use regulations, including subdivision and site plan regulations and the Zoning Ordinance. Section 2.8.8.2 of the PUD Ordinance also justifies departures from standards and guidelines otherwise applicable in Londonderry. Therefore, concerning all of the Project Master Plan, instances of conflicts between the Project Master Plan and any other Town standard, Ordinance regulation or guideline, the Project Master Plan shall control. See PUD Ordinance 2.8.3.6. It is Applicant’s intent however, to imply a comprehensive standard for development throughout the Project. See PUD Ordinance 2.8.10.2. Consistent with the purposes of all PUDs in allowing a landowner to “propose his/her own development project largely independent from current land use regulations,” development within Woodmont Commons shall be exempt from The Town of Londonderry’s impact fees. Instead, Section 2.8 of the Ordinance, and this Master Plan, are predicated on Applicant’s provision or arrangement for adequate public facilities necessitated by net growth. As such, the cost of new or expanded municipal capital facilities is anticipated to be minimal and the premise supporting the imposition of impact fees is inapplicable. 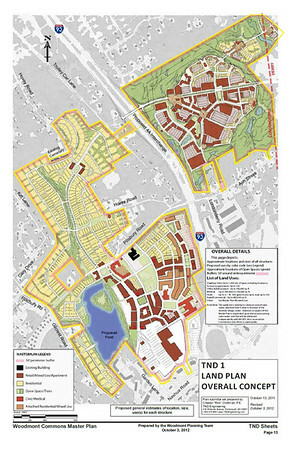 Woodmont Commons is in conformance with many of the goals and visions contained in the Town’s 2004 Master Plan. These include a diversity of housing types; the provision of complete, multi-modal streets; the encouragement of walking and bicycling which promote good health; the proposed development at Exit 4A from Route 93; and a diverse range of economic development opportunities. Specific Requirement: Conformance with the intent and objectives of this Section. As is demonstrated by the breadth of the entire Woodmont Commons PUD submission, the intent and objectives of the PUD are consistently addressed and met. 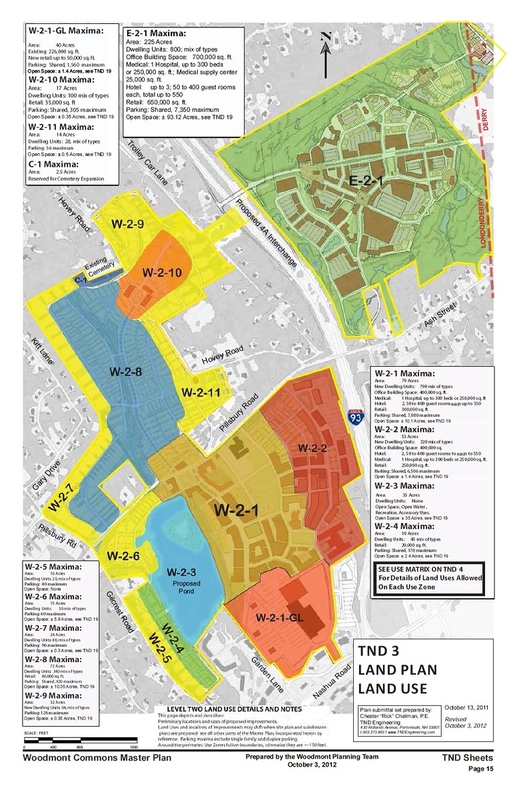 The Planning Board may grant waivers from this Master Plan, the Site Plan Regulations and the Subdivision Regulations in instances where the requested relief may be granted without substantial detriment to the public good and such a waiver will not affect the purpose and intent of the Master Plan. Specific Requirement: Infrastructure capacity and the effect of the PUD upon public services and public safety. This is fully addressed below under 2.8.9.2.14 of the Submission Requirements. Specific Requirement: Prospective fiscal impact upon the Town of Londonderry. A fiscal impact study has been agreed upon with the Town’s consulting review team and will be submitted during the 65-day review period. One goal of Woodmont Commons is to be revenue positive for the Town. Any other contribution given to the Town by the Project or any portion of the Project. The above Sum shall have a beginning date of October 14, 2010 and shall continue until the last residential Dwelling Unit building permit in the Project is issued. So long as the above Sum exceeds the expense to the municipality of providing essential services to the Project-area, the Project is Revenue Positive. Specific Requirement: Every PUD should incorporate a number of the following elements. Their usage defines a planned unit development and justifies departures from standards otherwise applicable under conventional zoning (introduction of new uses, more intensive land uses, higher density, novel design approaches, etc.). The following criteria shall guide the Planning Board in determining appropriate land uses, densities, and other development standards for the PUD. It is emphasized that the determination of whether or not a proposal meets the intent and objectives of this ordinance is made by the Planning Board in its reasonable discretion. The following outline how Woodmont Commons meets the goals and objectives of the PUD Ordinance through the inclusion of the following elements, as listed under section 2.8.8 of the Town’s PUD Ordinance, which validates the Applicant’s intent to depart from standards otherwise applicable under conventional zoning and related land use regulations. Specific Requirement: Inclusion of a harmonious mix of uses. Woodmont Commons will have several neighborhood centers providing a mix of residential, commercial, retail, office and recreational uses. These elements will be horizontally and vertically integrated where possible to provide a public realm accessible by different modes of transportation. The size and scale of these centers will vary depending on the local needs, population densities and their locations within the Project. Consistent with characteristics of the Use Zone, and the land uses permitted therein, noise created by any use in the Project shall not unreasonably impact others. Specific Requirement: Provisions for quality architectural design. Woodmont Commons’ architectural design will emulate the good characteristics of classic and walkable New England communities. While individual proposals will be subject to planning review and site-specific approval requirements, the images contained throughout this document and in 18. Architecture (2.8.9.2.18) on page 73 are intended to convey the conceptual styles of buildings and places to be constructed. A civic building should convey its purpose and civic nature as a part of the structure’s design. Specific Requirement: Placement of structures on most suitable sites with consideration of topography, soils, vegetation, slope, etc. The Master Plan takes into account, in proposed building placement, open space, and recreational areas, the topography, soils, vegetation and slopes. Specific Requirement: Preservation of open space. Woodmont Commons will include areas of publicly accessible open space. Walking trails will run throughout many areas of the site. Many dwellings will also be in close proximity to a park or green, and many of the streets will be designed to be linear parks for pedestrians and bicyclists. The Applicant intends to dedicate publicly accessible open space to a municipal or non-profit entity. Specific Requirement: Preservation of natural vegetation and other important natural features. In certain areas, such as along Gilcreast Road, apple trees will serve as a buffer. Elsewhere around the site a buffer of at least 50’ will be preserved around the Project’s overall perimeter. Careful consideration will be taken to preserve and enhance the natural vegetation that exists within Woodmont Commons. Where possible, these naturalized green spaces will integrate with greenways, the stormwater plan, and the continuous site buffers depicted in the Master Plan. In a few locations, past land use practices have altered the naturally occurring conditions. Specific Requirement: Preservation of important cultural resources such as stone walls and other archaeological sites. There are few remaining stone walls in the Project. Some land in the north of Woodmont Commons will be offered to the Town for preservation and expansion of the cemetery that is located on Hovey Road. Specific Requirement: Development of active or passive recreational areas. Many residents in Woodmont Commons will have easy accessibility to recreational land areas. The type and size of these areas will vary from small playgrounds, to open space, to larger fields for activities such as soccer and baseball. Some of the streets themselves will have similarities with linear parks, promoting walking and bicycling both as a viable means of transportation and as recreation. Landscaping is often utilized in suburban settings to provide buffers between land uses and between buildings and streets and parking areas. In some parts of the Project, especially W-2-1, W-2-2, W-2-1-GL, W-2-10 and E-2-1, commercial and mixed-use lots will not be required to have private landscaping. Trees within the street Right-of-Way, window boxes and other potted plants will be encouraged. Special emphasis will be placed on wooded features that promote groundwater recharge and long term nutrient storage. These locations will be designed to complement and enhance the Stormwater Plan. Invasive plant species will not be permitted. Specific Requirement: Use of sidewalks, bikeways, and other multi-use paths. As illustrated in the Appendix 3: Streets Specifications and Palette, most streets within the Project will have sidewalks on one or both sides of the street. Bicycle travel will be encouraged and integrated into the transportation system where appropriate. A series of trails or walkways separated from vehicular traffic will exist in select areas, such as adjacent to the future pond. Sidewalk and bikeway improvements along adjacent existing public streets may be impracticable due to impacts to private property, utilities, or other important resources, such as the desire to preserve existing trees. Specific Requirement: Use of traffic mitigation, calming, or Transportation Demand Management measures. In order to maintain safety and accessibility for pedestrians and bicyclists, traffic must be calmed, and most of the streets in Woodmont Commons will be designed to encourage lower vehicle speeds. Traffic impact studies will be done as part of the development process to ensure that the appropriate traffic mitigation measures are incorporated at the appropriate times. Also, Transportation Demand Management strategies to further mitigate vehicle impacts have been incorporated into the Master Plan. Specific Requirement: Significant screening of, or rear placement of, parking areas. Except in Use Zones W-2-1-GL and E-2-1, where impracticable and where now existing, permanent parking lots will generally be placed in the rear of buildings or otherwise significantly screened. On-street parking will be utilized in most parts of Woodmont Commons to reduce the size of surface lots, slow the speed of vehicles and to separate vehicle traffic from pedestrian traffic. No screening is proposed in W-1 as the buildings will be designed to frame the street. In Use Zone E-1, some screening may be required to soften the visual impact of buildings, parking areas, loading docks, trash disposal areas, exterior storage and other potentially unsightly areas as viewed from primarily traveled rights-of-way and parcels adjacent to the Project tract boundary. The above mentioned features do not need to be screened within alleys and rear lanes because these areas are designed to be limited access points. Specific Requirement: Sustainable design and construction practices promoting energy conservation. One of the fundamental benefits of building compact, walkable developments, in terms of energy conservation, is a reduction in vehicle miles traveled and the ability to use safer alternatives to the private vehicle. Woodmont Commons will be designed with several neighborhood centers, which will accommodate commercial users offering daily goods and services. Sustainable design and construction practices as well as energy conservation will be encouraged. Specific Requirement: Other public benefits such as provision of a community center or day care center. The Applicant is offering to provide lands for the expansion of the Town cemetery. Day care, Community Centers and Civic Uses are permitted in many Use Zones. Specific Requirement: Public access to community facilities in PUD. Municipally-owned or operated community facilities in Woodmont Commons will be publicly accessible. Please see TND 1, TND 2 and TND 3. Click for larger images. Specific Requirement: Proposed land use list. Please see TND 1, TND 2, TND 3 (above) and TND 4 and as herein described. In addition to the above and as set forth in Section 2.8.6.2 of the PUD Ordinance, any uses that exist or are permitted in the underlying zoning district either by right, special exception, or conditional use permit are also permitted uses in the Project. Existing legal and non-conforming uses are allowed to continue. All existing uses conforming with the underlying zoning may legally continue unless and until being re-developed pursuant to this Master Plan. All existing Dwelling Units and existing commercial spaces of all types are excluded from all of the maximum limitations imposed by the Master Plan (Limitations). Any existing Dwelling Unit or commercial space may be relocated or reconstructed. Any net increase in reconstructed commercial space shall count toward any use affected by Limitations. Buildings may contain multiple and mixed uses, with these uses varying both vertically and horizontally within a single building or on a single lot. All allowed uses are permitted to be combined within one structure or lot as a Principal use with allowed Accessory uses. Uses within buildings are also allowed to vary over time, consistent with the other provisions and restrictions herein. As a guideline to the above, TND 4 summarizes the allowed and not allowed uses in the Project by sub-district. Specific Requirement: Completed abutters list. The Completed Abutters List is attached as Appendix 2. Click here. Specific Requirement: PUD application fee. Michels and Michels check # 6928 in the amount of $5,000.00 was paid on 10/14/11.